On Monday August 11th, the Good Humor Truck will be helping Newton residents cool off with FREE ice cream! The Good Humor Truck will be giving out free frozen treats from 1:00 p.m. – 2:30 p.m. at the Walgreens located at 1101 Beacon St on MONDAY, AUGUST 11th. 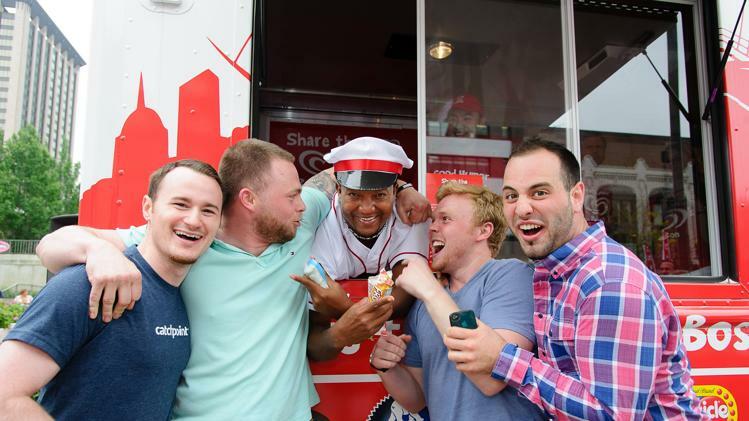 As you might know, baseball legend Pedro Martinez returned home to Boston as an honorary Good Humor Man to help kick off the brand’s Summer of Joy campaign earlier this summer. Pedro helped with the unveiling of the Good Humor Joy Fleet, which consists of the Good Humor Truck, a lineup of custom Good Humor Joy Squad Cars, and The Good Humor Man. The Joy Fleet has traveled the neighborhoods of Boston all summer long, bringing joy in the form of complimentary frozen treats. The Good Humor Joy Fleet will be out all summer through Labor Day; to keep track of its whereabouts, Bostonians can follow the brand on Facebook (facebook.com/goodhumor) and Twitter (@GoodHumor).